If alien civilizations have been trying to contact us for the last week and a half, their calls may have fallen on deaf ears. SETI's Allen Telescope Array, a set of 42 radio telescopes in northern California that scan the skies for potential alien radio signals, has been shut down since April 15, officials said. "Effective this week, the ATA has been placed into hibernation due to funding shortfalls for operations of the Hat Creek Radio Observatory (HCRO) where the ATA is located," SETI CEO Tom Pierson wrote in a letter to potential donors Friday (April 22). "Hibernation means that, starting this week, the equipment is unavailable for normal observations and is being maintained in a safe state by a significantly reduced staff." Microsoft co-founder Paul Allen initially provided $25 million for the ATA, which began operations in 2007. Since then, the array has been funded by SETI, the National Science Foundation, the University of California, Berkeley, and a variety of corporate and individual donors. The ATA network -- located about 300 miles (482 kilometers) north of San Francisco -- is supposed to eventually expand to 350 different instruments. But the budget problems are throwing a wrench into those plans as well, SETI and UC-Berkeley researcher Franck Marchis wrote in a blog post Friday. 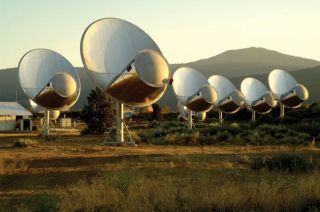 SETI is hoping to rustle up some more money to get the ATA running again. For example, the institute has been pursuing a possible collaboration with the United States military since 2009. The U.S. Air Force has expressed interest in using the telescope array to track the thousands of bits of space debris whizzing around Earth, Marchis wrote. This space junk poses a serious threat to spacecraft, satellites and astronauts on orbit. "We are continuing discussions with the USAF and remain hopeful that this effort will help provide future operating funds," Pierson wrote in the letter. "At the same time, we must strive to find other sources of funding to supplement operations costs and, very importantly, to support SETI science observations." Even if the Air Force doesn't sign on, all is not lost for the ATA, officials said. Scanning the skies for possible alien signals isn't terribly expensive work, especially since the infrastructure and equipment are already there. According to Pierson's letter, it costs about $1.5 million per year to operate the ATA, and an additional $1 million per year to fund associated SETI science efforts -- such as using the telescope network to scan for signals coming from the 1,235 potential alien planets discovered to date by NASA's Kepler space observatory. "One motivated donor could conceivably put the whole machinery of the search back in gear!" SETI astronomer Seth Shostak told SPACE.com in an email interview.